I just found Shorpy, a cool site with lots of old pictures. I particularly like the pictures of women from previous generations. Here's something to think about. Mrs. L.O. King was working as a Washington DC traffic cop . . . before she was even able to VOTE in this country. Interesting, no? You know, Nellie, that makes me think. In this country, there's not supposed to be any taxation without representation. Yet teenagers are taxed when they work--but aren't allowed to vote. Doesn't seem quite right, does it? Whoa - dang, Nellie, good point. 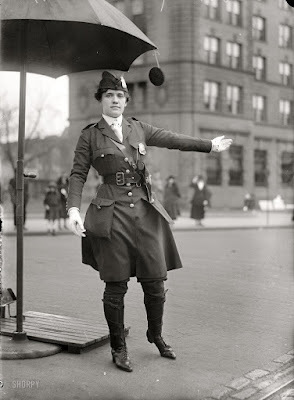 I also love that Officer King was wearing a skirt that was waaay short for the time period; other women were looked askance at for having skirts which brushed the tops of their boots instead of the tops of their shoes!! It's weird how people progress forward and then go backwards. Cool link! Did you see "Washington School for Boys?" too funny. I once took a photo like that. It was when I was pretending to be an outlaw. The picture, however, was ruined becasue I smiled too much. While I was holding a pistol. And it was loaded. VERY interesting, it doesn't seem right... but I'm wondering. Did anyone look at the people in the backgroud? This goes back to one of your previous posts. the one where you said you wondered how many times somone's taken a picture of you. I'm pretty sure one of them is waving. Plus I like the fact that she (the police officer) is wearing high heels and a pistol at the same time. ~ I don't think teens should be taxed when they can't vote... I'm going to write a petition, who's with me?! Whoa, I just realized the other woman has a gun too!!!!!!!!!!!!!!!!!!!!!!!!!!!!!!! Kirsten, did you do that on purpose? once women got the right to vote, it was extremely fashionable to cut your hair short and dress like a man, thus girls wear pants today. that was in the 1920's. Back in Febuary, you said you would post a preview from Book 3. I haven't been able to find it. Maybe I'm missing something...? The rumor is that kiki3 happens in Paris? You (anaka/kiki/kirsten) can't have run out of things that happened in New York that are interesting!!!!!!!!!!!!!!! But San Francisco is still cooler...where else can you buy a lime-green house, or a hot pink one, or one that's purple with gold trim? Here in San Jose (big but less famous city near San Francisco. We're now the 10th largest city in the U.S.), a strange humming noise is coming up from down under. Appearing about every third day, the humming sometimes seems to be travelling through the pipes, other times it seems to emanate from the ground itself. It's not an earthquake--believe me, I know what those feel like; I've been through 4 or 5 good ones, and this is not it. Also when is #3 coming??? Oh...wow. Y'know, women were doing a lot of things before they could vote. 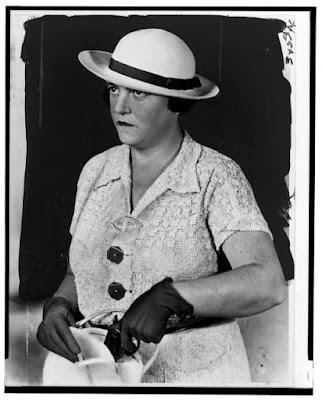 For example, my great-grandmother's grandmother was the postmistress of Valecita, CA. But then whoever was the boss of the post office fired her and sent a man to take the job. And guess what happened? The new postmaster LOST a bunch of mail--some of it very important. My great(x4? )-grandmonther never lost a single package. But did they give her the job back? No. The incompetent guy kept it. Random thought: I wonder if Luz Lopez ever had to fix a dishwasher? Ours is broken, and we have to handwash ALL the dishes. Lemme tell you, it's torture. I wouldn't wish it on Sidonia Galatzina. Well, maybe on Sidonia. In fact, yeah. The Princess should have to wash her own dishes. Or would that just make her meaner? Anonymous! What did I tell you people! No pestering geniuses! I love looking at old photos. Anonymous: I completely agree, San Francisco is so much cooler! And I only live about 45 minutes away from San Jose! PLEASE PLEASE REPLY IT WOULD MEAN SOOOOOOO MUCH CAN U GIVE US LIKE A MONTH! Nellie: An absolutely valid point! You know, either the policewomen had protested a lot or her employer must be quite liberal to allow her to do what was normally considered a 'man's job.' I hate chauvinism from men against women. Ugh. Oh...I've just remembered, I need to file my tax file number! Also, did you see the pic of the youngest lawyer--a woman! !--ever admitted into the Supreme Court? HEY KITTY! I DO KNOW EVERYTHING, BUT KRISTEN NEVER MENTIONED A MOLLY. WHO IS SHE? Did Google Street View Capture a Ghost?